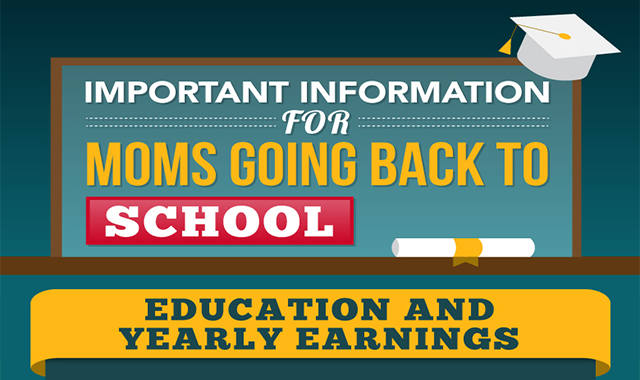 Important Information for Moms Going Back to School #infographic ~ Visualistan '+g+"
It’s not unusual for professional women to put their career on hold to focus on motherhood. It’s also common for moms to resume their pursuit of professional goals when the time is right. This return to the workforce can also correspond with continuing their educational goals. Those that do may place themselves in a position where greater job opportunities and bigger financial awards may be available.The combination of education level and age range typically impact how much a mom can make in the workforce. For instance, women with a high school diploma make an average of $28,553 between 25-29. This increases to an average of $31,807 between 30-34, $35,340 between 35-39, $36,732 between 40-44, $38,553 between 45-49, and $39,499 between 50-54.